I was thinking about saying 24 but 27 seems more appropriate. At any rate, after a couple of weeks with scruff/beard/stubble, I shaved off my facial hair. Maybe it had something do to with the fact I found three (or more) gray hairs poking through. Maybe it had something to do with the itchiness. Maybe it had to do with the guilt my electric shaver gave me. Yes, I’ll admit to somewhat of a love affair with it. How cool is it, it cleans itself. Is always ready for me anytime I want it. There’s something to be said about that. After all, it doesn’t ask much in return, just to make me happy while doing its job. I’m not saying that the stubble/beard/scruff won’t come back soon. I’m just enjoying a different look, a younger one. I remember when my dad shaved his beard, I couldn’t believe how young he looked. When I was a kid, I thought he must have taken some potion that made him look younger again. 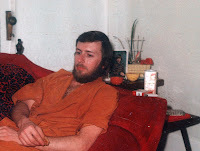 Check out the classic photo of my pop lounging around in his best Hefner look on the classic 70’s couch. Yes, that is a picture of me in the background. Please no comments on my attire, it was the late 70’s or early 80’s, yo! So yes, I again hope to have all of those people who don’t think I’m in my 30’s (ahem, mid 30’s) believe that I’m in my late 20’s again. Now all that I need is my hair cut because I’m looking a little like Shaggy again.